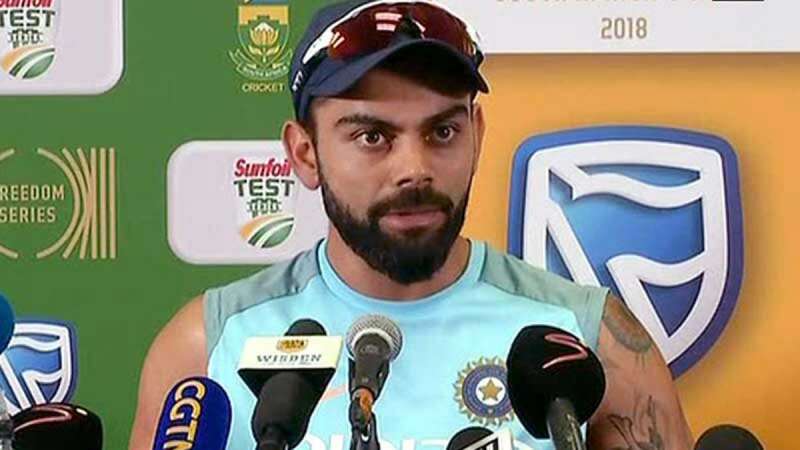 Centurion : India captain Virat Kohli on Wednesday lost his cool while answering a journalist's question during the media interaction after India's 0-2 Test series loss in South Africa. "Both skills haven't come together. Last time (in South Africa) we batted well, this time we bowled better. But it hurts when all the things don't come together and that's how you win test matches. They were far superior than us on the field as well," Kohli said. Kohli scored a fighting 153 in India's first innings but it went up in smoke as the visitors failed miserably in their second outing, managing just 151 while chasing 287 to win and level the series. Asked about the frequent chopping and changing in the starting XI ever since he has been captain, and whether that has affected the collective performance of the team as there is no consistency, Virat retorted by saying: "How many test matches have you gone out of 30?" The scribe hit back, saying: "How many times have you changed the team?" "(In all) 21 wins 2 losses, how many draws," said Kohli to which the scribe shot back, saying: "How many (wins) in India?" "Doesn't matter," said an irate Kohli. "Wherever we go, we do our best. I am here to answer your questions mate not fight with you." Later, a journalist asked if after the series loss and India's record being so poor away from home, does he feel as the No.1 Test side. Kohli said: "We have to believe we are the best side. If you don't believe you can win coming here, there is no point coming here. We have not come here to just participate. Answering your question, sir, how many times did South Africa come into the game in India? "We are not complaining about Cape Town either. The game was completed in three days... one was a washout. We have come here to play in all conditions. I am not here comforting my guys. I have asked them to be hard on themselves. I don't know what you have been listening to." "Partnerships of 60s and 70s do not help you win Test matches. We have identified that and we need guys who can put their heads down and build on a partnership after 60s and 70s. "Similarly, when you are batting as well you want to make a big 100. When we did well in Australia we got 450 runs every first innings but our partnerships were massive so that is something that we haven't repeated here." "South Africa did not have many big stands but they had one every innings which they used to consolidate their position. They deserve to win the series," Kohli said. "The incidents that took place in this match, the way we let go of good opportunities is not acceptable. So many soft dismissals also hurt. We prepare hard and when the momentum shifts due to these mistakes, you feel bad," Kohli said. "These are things an individual needs to sit back and reflect on. We have repeated our mistakes in two Tests and as a team that's not acceptable," he added.